Hello, and welcome to the page. 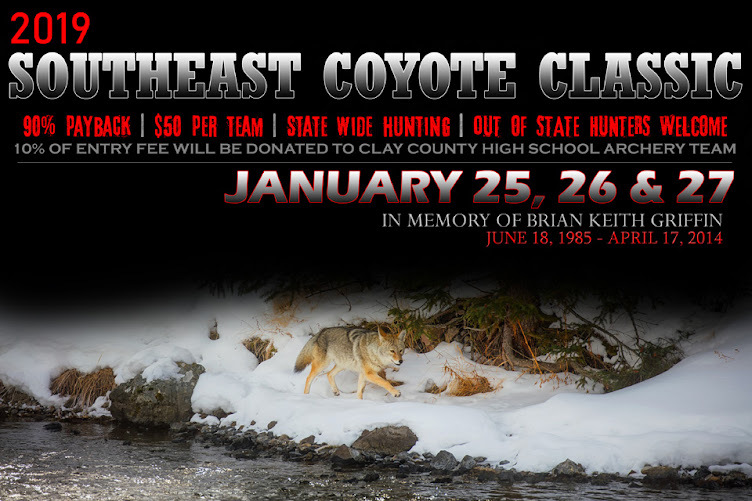 This page is dedicated to the Southeast Coyote Classic, which is set to take place January 25th, 26th & 27th of 2019. The hunt will be held in memory of Brian Keith Griffin. A fine man who was taken from his friends and family on April 17, 2014 while turkey hunting in Clay County Kentucky. You can read about Brian in the links section on the right side of this page, called Brian's Story. The Southeast Coyote Classic is a STATE WIDE coyote hunt taking place ONLY in the State of Kentucky, which means competitors can hunt anywhere within Kentucky. However, if you are a NON RESIDENT HUNTER and would like to take part in this hunt, all you need to do is purchase the proper hunting license from the Kentucky Department of Fish & Wildlife. A link to Kentucky's wildlife page can be found in the LINKS section to the right of this page under KDFW. This hunt is still in the early stages of planning with details still being worked out. As tasks are completed, they will be added here. Please revisit this page for updated information which, will be posted when they are finalized. Thank you again for visiting the page, and hope to see you in January putting some coyotes on the ground.